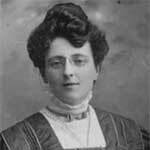 Lucy Maud Montgomery (1874-1942) looms large in the Canadian literary canon. Born in Clifton, PEI, she published 20 novels in her lifetime, along with 530 short stories, 500 poems and 30 essays. But it’s Montgomery’s series of novels starting with Anne of Green Gables in 1908 that made her an international phenomenon. With the possible exception of Superman, no fictional character of Canuck creation comes close to rivaling the international fame of Anne Shirley, Montgomery’s red-haired orphan girl who came to call the Prince Edward Island town of Green Gables her home. That first book has remained in print for over a century, selling more than 50 million copies in 20 different languages and helping make Prince Edward Island an international tourist destination. Montgomery came to Dalhousie when she was 21, and only for a single year (1895-96). While her cousin Murray McNeil (later, a Dal math prof and longtime university registrar) was able to study with a scholarship, Montgomery was not — a pointed fact in their tiny rivalry of sorts. Montgomery had to scrimp and save her teacher’s salary over two years to afford her short time in Halifax, during which she studied in what is now the Forrest Building and lived at the Halifax Ladies College.